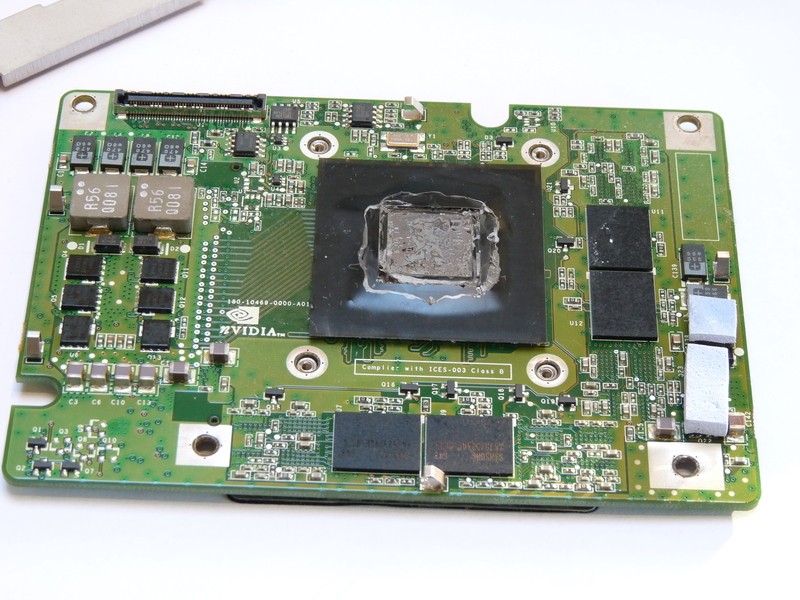 Bake your graphic card back to life! I bought my Dell XPS M1710 in January 2007, so it’s three years old now. Except some overheating issues, which I solved by cleaning the fans and applying Arctic Silver thermally conductive compound, I didn’t really have any major issues with this laptop. 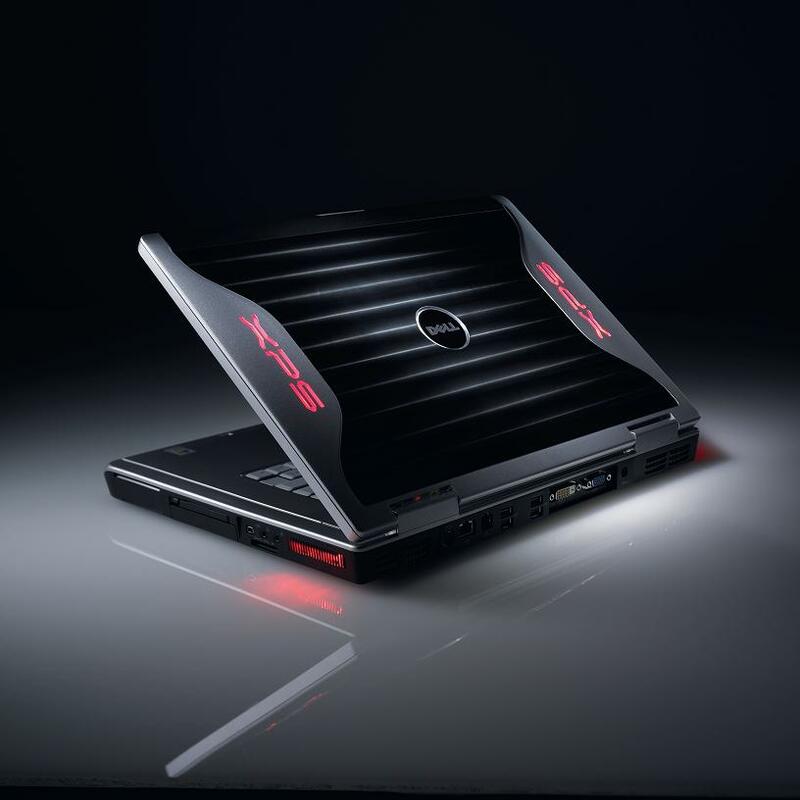 If you want more information about letting your XPS run cooler, please follow this link. A few days ago strange things started to happen. During the boot up of the system, random pixels and stripes appeared, even at the BIOS screens. The Windows loading screen was normal but then a final screen with pixel distortion came up and the screen turned black. I had to shut down the system by holding the power button. Some browsing on the internet with my desktop pc confirmed my fear: my graphic card was fried. Apparently this is a common problem with Dell’s gaming rigs which are terrible at heat management. Some forums report problems when the laptop is only one month old. I guess I am lucky it worked for 3 years. As my warranty is expired, my first reaction was to search for a new graphic card on eBay and other second hand sites. The graphic card in my system is a Nvidia 7950 GTX and they are being sold on eBay but at crazy prices! No way I’m going to pay about 300 euros for a second hand card that gives me absolutely no guarantee about how long it will work before frying again. I disassembled the XPS, took the graphic card out and removed the heat sink. For detailed disassembly instructions for the XPS, please follow this link (Dell XPS M1710 Service Manual) and read my other article. I used some aluminum foil balls as a support system and baked the graphic card at 200 degrees Celcius. After 10 minutes I shut down the oven and let it cool down for another 20 minutes without touching the card. One thing I forgot to do was remove the plastic foil around the GPU core. I thought it would be heat resistant but after the baking process the foil had shrunk and burst. 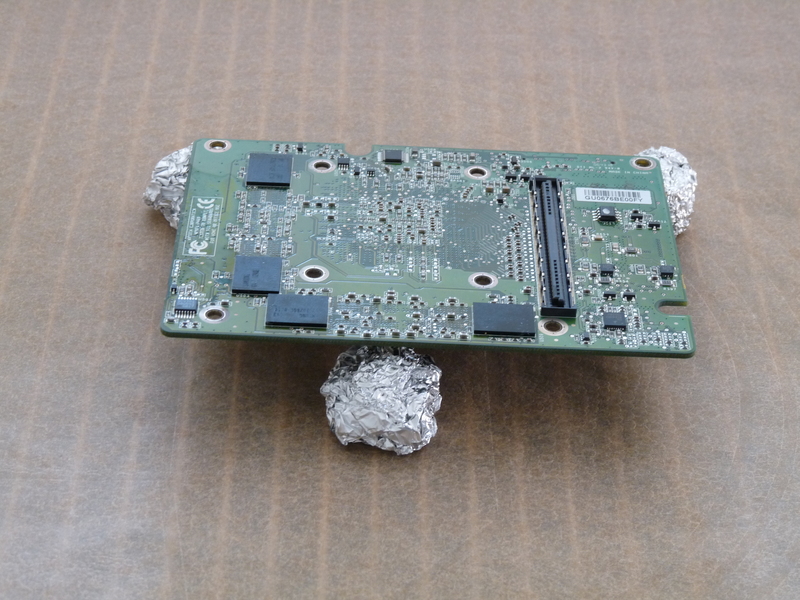 I removed the foil which covered tiny electronic components and some left over hardened heat conductive compound. I cleaned the core with rubbing alcohol and some paper towels. I had to use quite a lot of rubbing alcohol and apply some power rubbing the tiny electronic components so I had little hope that the card would ever work again. Then I reassembled the whole thing and with thumping heart I pressed the power button. The difference was immediately visible: no more random pixels! I had to press F1 to continue because I had removed the CMOS battery when removing the palm rest. After that Windows booted up just fine! I have rebooted the system a few times and have run some graphic intensive software and everything is still working! No one knows how long it will keep working but if it fails, I’ll just bake it again! As a proof, here is a video explaining the process and a demonstration of how the bootup looked before and after! My Dell E1705 with X1400 ATI Mobility VGA Card went down with NMI Parity Check / Memory Check error 2 weeks back. 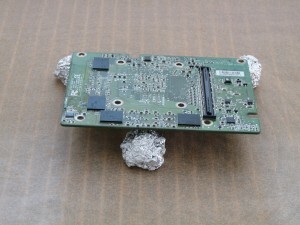 Initially I followed the basic stuffs like cleaning the laptop, removing dirt at Fans etc. The BIOS Diagnostics tests fails at Video Fan Test. Fan is not running at full speed. Contacted Dell. The system is 5 1/2 Years old and Dell told they don’t have any option to extend warranty or repair the system as it is too old…. Based on my analysis it is purely due to the GPU Fan is not kicked at proper intervals leading to this issue. Yesterday I baked the card. During the start of the process after pre-heat I saw some sparks coming when I kept in Microwave Oven in Convection Mode at 200 c. I aborted the process in 2 sec. Cleaned the stuff. One Clip accidentally touched the below iron plate and it burnt. Second time the aluminum foil in one screw holders touched the outer board and sparkled. In the third attempt it succeeded. I didn’t keep the temperature for 200 C. I limited it down to 150 C itself for 10 minutes. After I assembled the DELL Logo started working fine… Kudos to this article… The thermal paste which i procured locally was not good. The card is getting hot very soon and searching for the GPU Fan for E1705. My girlfriend’s XPS m1710 has the same issue, a loooong time out of warranty, so will give this technique a go!! It will save her buying a new laptop for the time being if it works!! gosh, last thing, instead of slow cool, I popped it in the fridge for a quick cool hoping it’ll harden a little better. ah, I just realized something, my oven is displaying F not C… so 210 F worked. That is pretty close to 100C which is pretty close to where these things are faulting anyway. Perhaps next time I’ll really crank up the heat, if necessary, otherwise you may not have to go so hot as 200C. modification suggestion: I had a pretty quick relapse on both cards so I tried slightly more aggressive parameters. 210 degrees, 15 minutes, and I flipped the cards half way through. I then gamed for a while and have seen the temperature touch 100 degrees and the card is still working. Hope this helps someone. I just simultaneously baked 2 cards at 200 for 10 minutes (one for closer to 15). One was the 7900 and the other the 7950gtx. The 7950 I tore down the heatsink. The 7900 I just left it on. The 7950 had the typical lines on the bios, with the 7900 the machine would blink and shut off. After baking them both they both WORK! I’ll use the 7900 for now and wait for some arctic silver to show up for the 7950. Wow, 2 out of 2! Today, 9 months after the first meltdown, the graphic card died again. So I dismantled my laptop, baked the card and put it back together. And here I am, typing this message on my revived laptop. So here’s the proof that it works, even the second time. Just to back this up – I’ve exactly the same laptop and GC (M1710 with a 7950GTX) and I’ve had the same problem. Paid dell £350 for the first replacement graphics card, then 13months later some problem. Came across this and thought I’ve not got much to lose so may as well try it. And Hey presto – Working fine and I’ve put the GPU under pressure with FurMark with no problems. Sorted. Thanks for publishing this. I’m in the same position. I’m waiting for thermal paste delivery so I can proceed with this. One question regarding this foil around GPU. I just removed it. Did you apply any other after that. Is it actually necessary because my is broken now anyway. I hope it will work after all. I didn’t replace the foil. I couldn’t really understand the use of it. The thermal paste I used is Arctic Silver. Btw: 6 months later, my laptop is still up and running! At the moment these temps are during normal browsing on the internet, but when I start to open some programs the temp of CPU quickly rise to 50-60*C. Is it normal? I’ve checked on the internet and for Intel T7400 ia 0-100*C.
Could you tell me yours so I can compare and if something is wrong I will maybe re-apply thermal paste (BTW: I used Arctic MX-3)? Maybe you can find a solution there, but you’ve already done the best thing: replace the crappy heatpads with thermal paste. Did you clean the fans? Holy crap! It actually worked! I tried this as a last resort as my warranty is way expired. I’m up to about 3 hours gaming without problems (knock on wood). Laptop appears to be running slightly cooler and the fans are definitely not working as hard. Taking apart the laptop was a bit scary but directions from Dell are pretty clear. Thanks for posting this page! I’ve read about this before but always dismissed it as an unlikely solution. I’ve found myself in the same position as you (albeit with a 7900GS model). After stumbling onto your article I decided to give it a try (why not, right) and to my surprise, it worked! Great article, great solution.